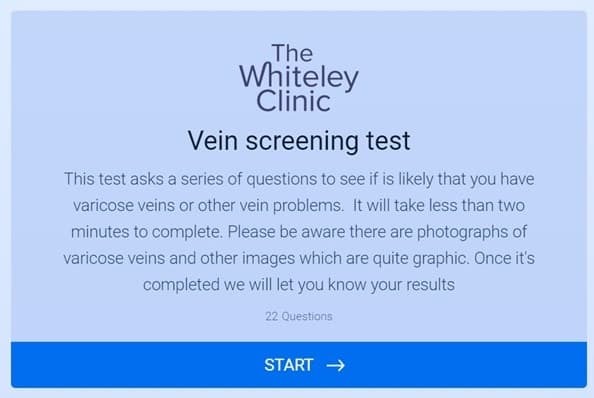 Veins screening is available online at The Whiteley Clinic website. The simple online test contains 22 questions. It will give you an opinion as to whether you need formal consultation and scanning for vein problems. To check your leg or pelvic veins, simply click on the link to the vein screening website. This will take you through a series of pages. Some will have pictures. Some will have questions. Click on the most relevant answer on each page. At the end of the process, your results will be collated and sent to you by email. The whole process is free and does not cost you anything. 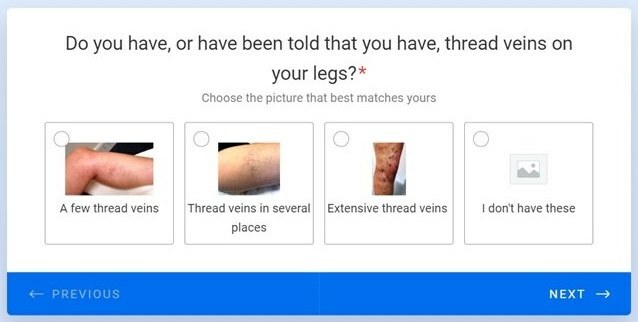 What will you get from the vein screening website? Using the information that you have provided, we will give you the best opinion that we can from the information that you supply. This will range from saying that you have no evidence of venous disease from the answers you have given. At the other end of the scale, if you have clear evidence of venous disease, you will be guided as to which consultations and tests would be appropriate. If at any time during the process you want more information, you can contact The Whiteley Clinic by email. We hope that you find the online vein screening useful.